The trip for the last home game of the season can allow for a whole myriad of emotions depending on how the previous 36 games have gone. 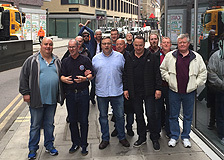 We have turned up in the airport for these trips following some great displays during the season and yet we have also met knowing that we are doomed to play Championship football the following season. This time we met at the airport and were unsure of what lay ahead. My own feeling was that we would lose this game, following the fantastic win over the Spuds the previous week, Liverpool’s poor display against Southampton, the fact that we already were “safe” for another season and the players would be getting their sun tan lotion at the ready rather than shin guards. 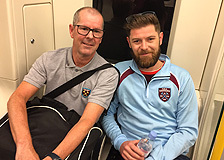 Meanwhile, Tommy had a bet on that we would win 2-0; Gary had a bet on that we would win, lose, draw in both the first and second half and had 15 players down as first goal scorer!!! 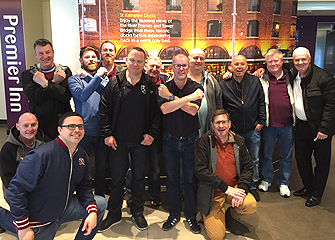 Anyway, as we gathered in the bar in Dublin airport spirits were high, drinks were being consumed and the jokes were flying. Travel Sec, Tom Jones handed each of us an envelope that contained your ticket on the Stanstead Express, match ticket and details of where we were staying, pubs and clubs, things to do and see and other interesting tourist stuff. We all had a laugh at his description of the nightclub in Shoreditch that he thought would suit Craig! The flight was uneventful and to our great surprise landed on time. Three cheers for Ryanair! On to the Stanstead Express and we are disappointed to discover that we don’t have our own carriage. 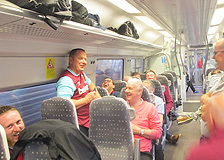 Liam’s usual trip speech is overheard by all the other travellers on the train and we have to fight them off as they wanted to be part of the trip. Tom Jones led the walk to the hotel and we dropped our bags and headed off to Stratford’s Best Café for breakfast. It is very good and Liamo is well in with all and sundry in the place. Following the brekkie we head up to the ground to go to the shop and look for our plaque. The shop as ever was overpriced for everything and the sale items were in sizes S, 3XL or 4XL so it didn’t fit me. 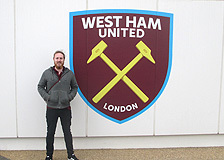 I stuck to my usual purchases of a few WHU pens – they never get robbed on me in work. 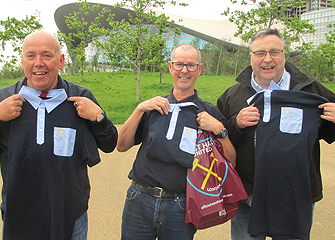 The DH Committee and various sub-committee members all opted to buy the same style shirt, unbeknownst to each other, so we look forward to the AGM where they will all look the same!! Tommy bought two programmes... for the previous week’s game, in error I might add, which provided us with a good chuckle. 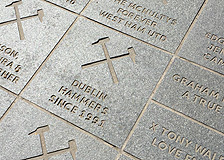 Then it was time to look for Dublin Hammers plaque, with Liam organising the grid search the lads eventually found it and photo evidence was secured, but only after a few attempts, as word has it that the owner kept pointing to the wrong stone? 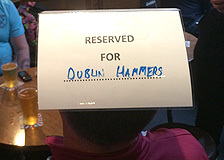 After that we headed to Ye Old Black Bull pub where there was an area reserved for Liam/Dublin Hammers. 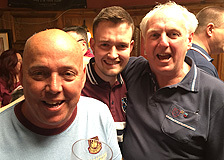 It turned out to be a great choice of pub with good beer, a very obliging landlady and both footie and racing on the TV. The theme tune quiz was a blast. We headed back to check into the hotel and plans were made for what we would do later on. The plan was to go for a few beers then come back, shower, get ready and head to an 80s night in St Pauls. We got as far as the “go for a few beers” part. 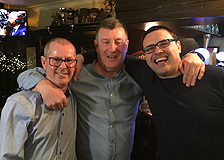 We found ourselves in the Bar Locks pub with a great jukebox and many pints later I headed back to the hotel for a bite to eat and… went to bed! 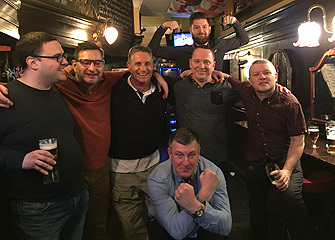 The reports next day was that the lads headed to a few other pubs and got home in the early hours following a great night out. 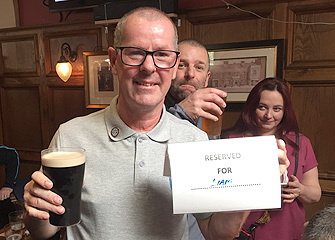 Sunday saw us again visit Stratfords best café before meeting up in Ye Old Black Bull where again Liam had arranged reserved tables and a storage area for our bags... Liamo for Travel Sec. 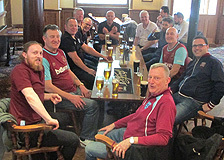 We were joined by our East London friends and other club members who had travelled over on the Sunday morning. Then on to the stadium. 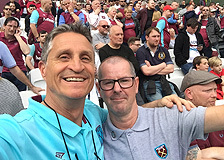 I have to say the atmosphere going up to the ground was fantastic with everyone singing, the sun shining and the jokes flying. All the grassy open areas around the stadium were full with people sitting out drinking and enjoying the sunshine, the terrace bar that over looks the river was packed. 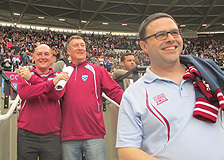 The game started and we were in great voice. 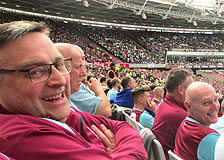 Unfortunately this was as good as it got as West Ham conspired to put in the most abject performance I have ever witnessed – we were f$%ken awful! Liverpool couldn’t believe how easy it was and they could have scored 10 against us if it had’nt been for some great saves from Adrian. 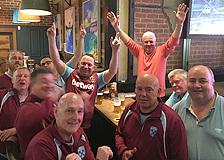 After going one down, we had the chance to equalise only for Ayew to hit the post twice from 3 yards out… “miss of the season” it was described as on the TV. We were denied a clear penalty, but that was about it. Liverpool came out in the second half, went up a couple of gears and that was that. With half the first team out injured we just couldn't compete. As the fourth goal went in, the atmosphere in the stadium turned toxic and fans started arguing with each other – it wasn’t pleasant. 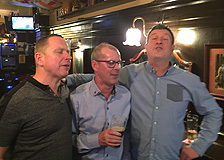 Thankfully the final whistle went and we headed back to Ye Old Black Bull for a few beers and post-match analysis and general sing song, one rendition of “Sweet Caroline” was memorable as the whole pub joined in and raised the roof! Then it was time to say goodbye and head back to Stanstead. Again we didn’t have a reserved carriage on the train… Tom Jones Out!! 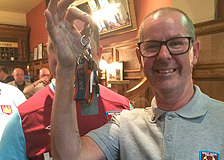 But we did have a quiz courtesy of Tommy who unfortunately was “tired and emotional” following the long day. We nearly wet ourselves as he tried to read out the questions, give the wrong answers and generally make a mess of it… Fran Ryan your job is safe! Back in the airport and as usual we head to the bar for last orders. The flight was delayed so Ryanair kept quiet about it and we landed safe and sound in Dublin. As ever I apologise to everyone on the flight who suffered as a result of my snoring. 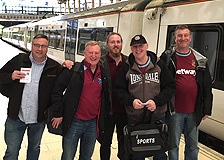 Well done Tom, Liam, Brian, Dessie for all the Spot the Balls, Gary for his usual quiet demeanour and all the lads for a fantastic trip… oh and well done West Ham for attempting to screw it all up!!! 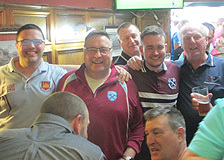 Report & Photos by Gerry Murtagh & Paul Smith. 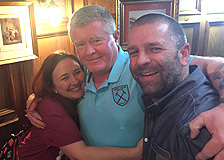 A special thank you to Gerry for taking the time to write this report.